McKinsey Case Interview Tips gives you wisdom that will help you get a McKinsey job offer! Case interview prep can be tough, but in this video Jenny Rae describes specifically what you need to do in your McKinsey interview. Take these practical case interview tips and work them into your preparation and McKinsey interview practice. 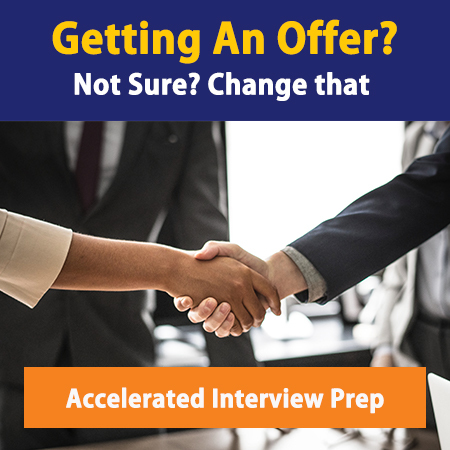 If you’re not feeling confident, take a look at our accelerated case interview prep course to get you where you need to be! The McKinsey Case Interview. It’s enough to make people tremble in their shoes. And admittedly, McKinsey case interviews have a reputation for going the deepest, and having the hardest math, in all the case interview universe. So here we are today, with 5 tips on how to succeed – specifically in the McKinsey case interview. #1- McKinsey values structure. And when they’re talking about structure, they don’t just mean structure at the beginning of the case. They mean structure for your analysis, they mean structure in your notes, they mean structure in your brainstorming. They even mean structure in your conclusion. You need to maintain structure, i.e. organization, very clear linear thought processes, the entire way through your McKinsey insight driving. Across the board, McKinsey is the most structured firm out of all of them. And if you’re able to key-in on areas where you can identify better ways to improve your structure inside the case, you’re going to perform better on the interview as a whole. #2- You need to solve your math to the ones place. Not to the decimal place, but to the ones place in a McKinsey Interview. Why? When a McKinsey interviewer comes into the room, they have a packet of information that has exact answers calculated on it. They are not looking for rounding. And they are not only interested in insights. They care about your calculation prowess. That’s different than other top firms, like BCG or Bain. And you have to make sure that you’re ready for that, so when you’re practicing, you need to practice rounding only to the ones place. More exact math matters to McKinsey. #3- In McKinsey interviews, you can take time in between each of the questions to prepare an answer. About 30 seconds is appropriate. 1 minute is the maximum. So when you get a math problem that seems pretty challenging, recap for it, and then take a minute to plan your structure & approach. Then come back and walk through your structure as well as your calculations. When you get a brainstorming question, take 30 seconds to identify a couple of areas, and then come back with a more structured answer. Remember, this is only appropriate in McKinsey. So if you’re practicing for a McKinsey case interview as well as other interviews, you want to make sure that you’re not just practicing this way, but that this is just a tweak that you make when you’re about ready to walk into the room for McKinsey. #4 – Next, it’s really important that when you’re in the room with McKinsey, you remember this: they are looking for one magic thing. They call it, “Second Level Insights.” And recently they’ve even been talking about “Third Level Insights,” which really are just better second level insights. The way that we divide it at Management Consulted is: Level 1 insights are insights about what the data says. Level 2 insights are insights about what recommendation you have the client will take in terms of action. So they are more advanced, they go deeper, and they require more of an organizations’ mobilization. When McKinsey says Third Level Insights, what they’re identifying is that within second level insights there are some insights which might seem a little bit left field, or right field, they are not core. They might be really important when you push into them with further data analysis. …it will help accelerate your specific prep for McKinsey -make you more like a McKinsey walking and talking consultant…and help them identify, even in a subliminal way, that you are the next greatest McKinsey consultant to show up in their office for the interview. We’re excited to help you ace your McKinsey case interview.